A Hellenistic era temple which dates back to more than 2,000 years has been unearthed in archaeological excavations in central Turkey. 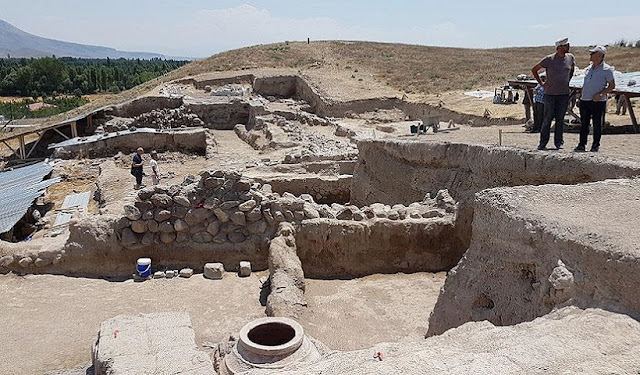 The 2,100-year-old temple was found in Kınık Mound, an archaeological site located in Yeşilyurt village of Altunhisar district, Niğde province, southern Cappadocia. A team of Turkish and Italian archaeologists has been working in the site since 2011. In 2016, a 2,500-year-old temple dating back to the late Persian era had been discovered at the same site. Professor Lorenzo D'Alfonso, a New York University academic and head of the excavations, affirmed the temple dated back to Hellenistic time. "We continued excavations just below the place where we found the temple, and we found another temple dating back to the Hellenistic period, 2,300 years ago," D'Alfonso told Anadolu Agency on Saturday. D'Alfonso said that Kınık Mound likely hosted no city or settlement since 30 B.C. "We also found parts of a bull statue made from ceramics," he added. "Two hundred seven movable cultural properties have been brought to the Niğde Museum (found) in these excavations since 2011," said Basri Akdemir, the provincial director of culture and tourism. The excavations come as part of a 10-year joint project between University of Pavia, Institute for the Study of the Ancient World and New York University, supported and participated by Turkey's Niğde and Erzurum Universities.